The app can be downloaded from Kaspersky's servers and isn't available directly from the Android Market. The cost is rather high - $29.95 per year, although it is still comparable to products like Lookout Premium. WOBURN, MA--(Marketwire - February 22, 2011) - Kaspersky Lab, a leading developer of Internet security solutions that defend against computer viruses, spyware and all forms of malicious software, now offers protection and peace-of-mind for BlackBerry and Android smartphone owners, in addition to Windows Mobile and Symbian devices. Available for purchase today across North America, Kaspersky Mobile Security 9 now offers anti-theft and privacy features for the world's four most-popular mobile operating systems -- Symbian, Windows Mobile, BlackBerry, and Android. With BlackBerry's many devoted users and Android smartphones being purchased by American consumers at unprecedented rates, people have become more connected and dependent on these mobile devices. The potential harm caused by a lost or stolen smartphone also increases. Kaspersky Mobile Security 9 ensures a lost or stolen smartphone is only an inconvenience, and not a devastating loss of personal data that can lead to identity theft and financial fraud. If a mobile device is lost or stolen the SMS Find feature can view the smartphone's real-time GPS location displayed on Google Maps. Then via a link, the location is sent automatically to a pre-determined email address chosen by the phone's owner. Kaspersky Mobile Security 9 users can remotely block communications to-and-from a missing device, and can lock-down a missing smartphone to prevent anyone from private information. Users can also remotely delete all data from the smartphone, protecting contacts or sensitive information from unauthorized use. If the thief tries to circumvent these GPS tracking and data-deletion programs by replacing the device's SIM card, Kaspersky Mobile Security 9's SIM Watch will send the device's new telephone number to the rightful owner's pre-determined email address. If the SIM card on a stolen smartphone is switched for a different card, the owner the rightful owner will still have the ability to delete sensitive data, and can provide the phone's new number to wireless service providers and law enforcement agencies that can track and recover the stolen device. Also new to the Android and BlackBerry platforms, Kaspersky Mobile Security 9 can be used to control incoming and outgoing content, allowing users to easily block spam text messages and phone calls from unwanted numbers. This ensures no more text-message spam, and no more annoying phone calls from telemarketers or other unwanted callers. With Kaspersky Mobile Security 9, Android users now have the best anti-malware protection from rouge software or applications on the constantly-expanding Android landscape. Android smartphones using Kaspersky Mobile Security 9 will be equipped with an antivirus scanner to protect against all known types of mobile malware, preventing malicious programmers from hampering the phone's functionality or capturing mobile data. If these 'mini-PCs' are ever subjected to the cybercriminals that target PCs and businesses today, users can rest assured they are well protected. Android smartphones also benefit from Kaspersky Mobile Security 9's Privacy Protection features, which allow users to keep certain contacts and all communication with those select contacts -- including calls and SMS texts sent and received -- hidden from prying eyes. While in Kaspersky's Privacy Protection mode, selected contacts will not appear in the phone's address book, the phone will not ring if they call, and there will be no notification if they send an SMS message. Once the user enters a code to disable Privacy Protection, all missed notifications will then appear. Ideal for ensuring sensitive communications stay private while on-the-job or in other public settings, Privacy Protection can also be used as a filter during times when users don't wish to be interrupted. For example, instead of turning the phone off, a user can place all contacts except for family members into Privacy Protection mode. This prevents unnecessary interruptions during an important business meeting, but ensures the user can still be reached in an emergency. "Android is taking the market by storm. And Blackberry has a long history of dedicated users. Now both can feel more secure and better protected with Kaspersky's latest mobile technology. Kaspersky Lab is glad to be there to help when an unfortunate incident befalls any mobile customer. We're there to protect their sensitive and personal information and identity, and now Kaspersky Mobile Security 9 does it better than ever." 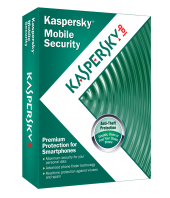 The new version of Kaspersky Mobile Security 9 is a subscription-based offering available now for purchase through the Kaspersky online store at www.kaspersky.com for $29.95 per license, renewable annually. The software is compatible with all smartphones using the Symbian OS (versions 9.1 through 9.4 or higher), Windows Mobile (5.0, 6.0, 6.1 or 6.5), BlackBerry (4.5 - 6.0), and Android (1.6 - 2.2). Wirefly Unboxes Motorola XOOM: "The Next Generation In Tablet"